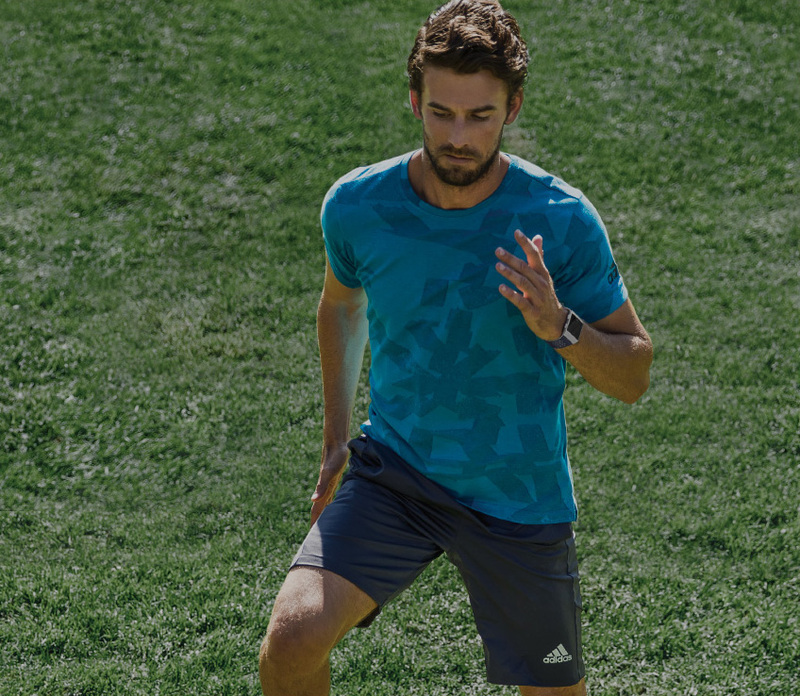 Adidas Train: Access exclusive, run-focused exercises with step-by-step coaching that guides you through the moves. Signature Band: Wear a two-toned sport band in Ink Blue and Ice Grey with Silver Grey aluminium case. On-Screen Workouts: Access pre-loaded on-screen exercises like 10 Minute Abs and more. 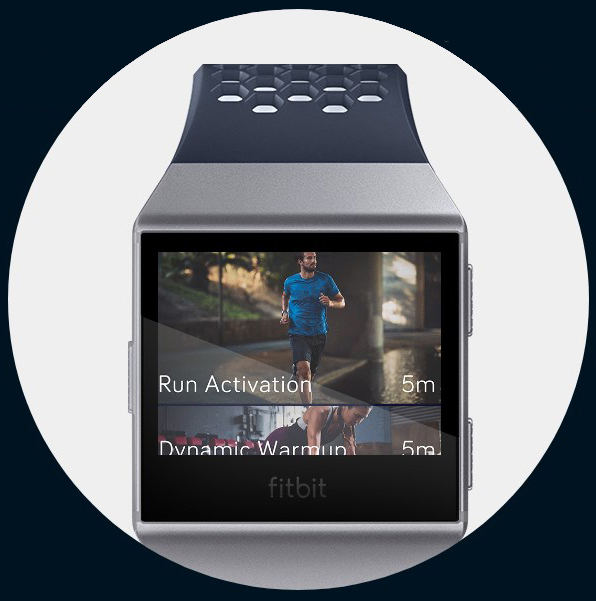 Built-In GPS: See real-time pace and distance on display during outdoor runs and rides. 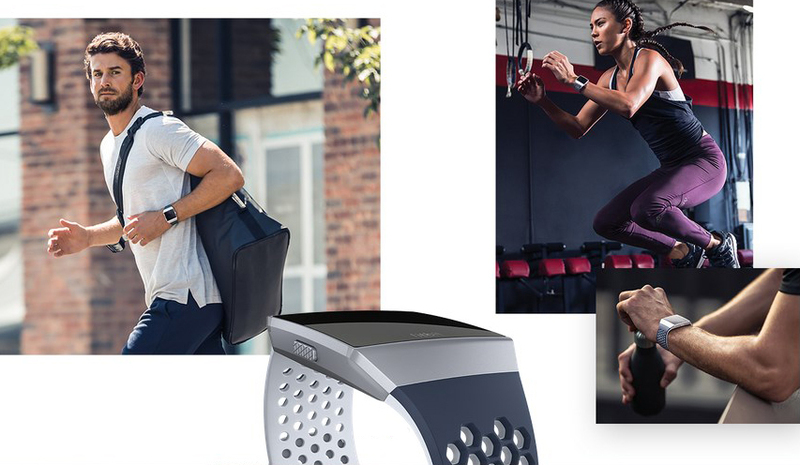 PurePulse Heart Rate: Get continuous, automatic heart rate tracking and real-time heart rate zones. Water-Resistant & Tracks Swims: Wear in the rain or the pool, track laps, and get insights about the duration of your swim and total calories burned. Multi-Day Battery: Enjoy a battery life of up to five days and up to 10 hours when using GPS. Popular Apps & Notifications: Instant access to call, text and calendar alerts, and apps for weather, sports and more. Makes Payments: The NFC chip lets you access your credit cards to pay on-the-go with a few simple swipes. Activity & Sleep: Automatically track all-day activity and time in light, deep and REM sleep. Multi-Sport & SmartTrack: Use exercise modes for real-time stats on screen or automatically track exercise with SmartTrack. Interchangeable Bands: Change your band from day to night with sleek accessories in leather and sport. Sold separately. Wireless Syncing: Automatically sync stats to 200+ leading iOS, Android and Windows devices. 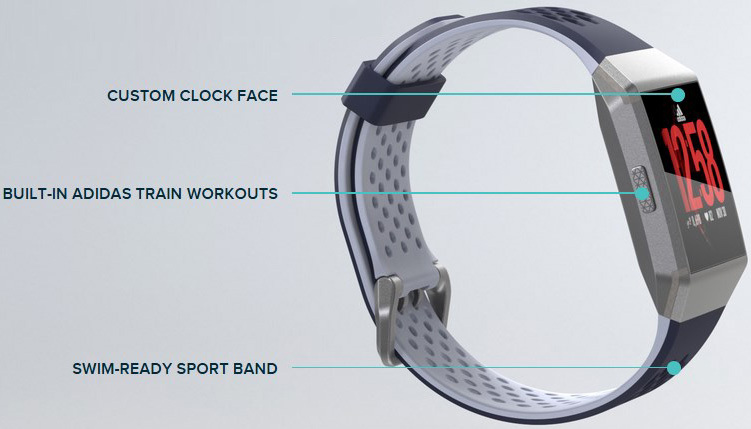 Intelligent Frame: Nano-moulded unibody packs 8 different sensors in one watch. Water-Resistant: Seamless watch case is water-resistant up to 50M. Integrated Antenna: Frame holds a GPS antenna for stronger satellite connection. Premium Materials: Strong and lightweight 6000 series aerospace-grade aluminium. Hi-Res Touchscreen: Increased pixels and amplified brightness up to 1000 nits. Durable Screen: Corning Gorilla Glass 3 is tough and damage resistant. Quick Band Attach: Easily swap accessory bands for different styles. 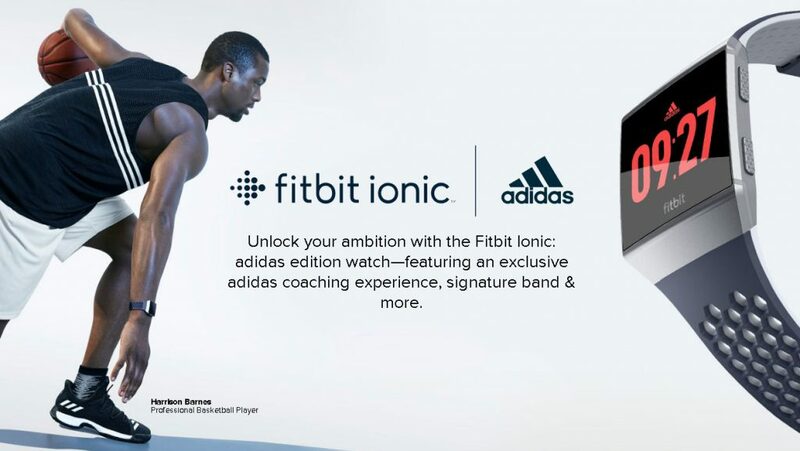 Commit to extraordinary with Fitbit Ionic: adidas edition - a watch designed with exclusive experiences that help you get to the next level. Dynamic warm up: Increase your core temp and get ready to run. Power pace: Train the body to be more elastic, forceful and efficient. Metabolic: Use interval training to boost speed and metabolism. With a two-toned breathable sport band and an adidas-designed clock face inspired by the iconic race bib, this watch was made to Motivate. Battery and Power Battery life lasts up to five days with a GPS battery life of up to 10 hours. We recommend charging your Fitbit Ionic every few days to ensure you're always tracking. Battery life and charge cycles vary with use and other factors; actual results will vary. Memory Saves seven days of detailed motion data – minute by minute. 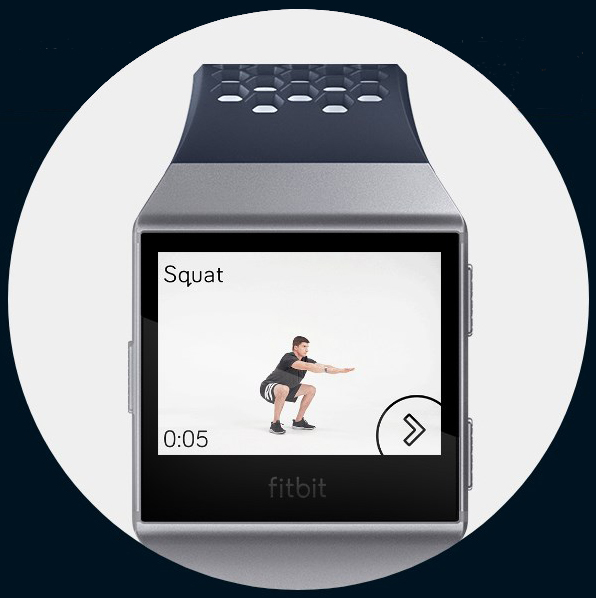 Water Resistance Fitbit Ionic is water-resistant up to 50 metres and is sweat, rain and splash-proof. With any wearable device, it’s best for your skin if the band stays dry and clean. Care If the band gets wet or if you sweat in it, remove and completely dry it before putting it back on. Give your wrist a rest by taking the band off every now and then. Materials The wristband is made of a flexible, durable elastomer material similar to that used in many sports watches and the buckle is made from surgical-grade stainless steel. Heart Rate Like all heart rate tracking technologies, accuracy is affected by physiology, location of device and different movements. Syncing Fitbit Ionic syncs automatically and wirelessly to computers and more than 200 leading iOS, Android and Windows devices using Bluetooth 4.0 wireless technology.